Community Eye Health Journal » What’s new in glaucoma treatment? Comm Eye Health Vol. 19 No. 59 2006 pp 33-35. Published online 01 September 2006. What’s new in glaucoma treatment? Co-ordinating Editor, Cochrane Eyes and Vision Group (CEVG), International Centre for Eye Health, London School of Hygiene and Tropical Medicine, Keppel Street, London, WC1E 7HT, UK. Interventions for the treatment of different forms of glaucoma have been tried and tested for many years. The idea that lowering the pressure might be helpful was first proposed more than a hundred years ago. By the 1950s, it was established that raised intraocular pressure (IOP) was glaucoma, and vice versa. However, in the mid 1960s, Fred Hollows and Peter Graham demolished that simple concept by revealing that there were many people in the population with raised IOP but no glaucoma, and people with glaucoma without raised IOP.1 Nevertheless, IOP remains an important risk factor (and the only one we can modify) for a group of conditions characterised by a progressive atrophy of the optic nerve associated with typical structural and functional abnormalities. Only quite recently has robust evidence emerged regarding the effectiveness of treatment for open-angle glaucoma (OAG). There is still uncertainty about the best way to manage chronic angle closure. This discussion focuses only on the primary glaucomas in adults, open-angle and acute, and chronic angle closure. The first major systematic review was by Rossetti et al. in 1993.2 Despite finding more than 120 randomised controlled trials (RCTs) of the medical treatment of open-angle glaucoma and ocular hypertension, the authors could not find good evidence that lowering IOP either prevented the development of glaucomatous optic nerve damage, or prevented its progression in established disease. Researchers complained that it would be unethical in a trial to randomly allocate patients with overt disease to a control group with no intervention or placebo; yet they had to confront the ethical reality that the effectiveness of treatment was uncertain. The ethical challenge was already being met by the collaborative normal tension glaucoma study.3 Many patients with this form of glaucoma were not routinely receiving treatment. Patients were recruited with OAG whose pressures were never found to be higher than 24 mm Hg. Patients were not randomly allocated to pressure-lowering intervention until they showed definite evidence of progression. About 40 per cent of participants did not progress in five years. This was an important observation on the natural history of the disease. Vision declined in both treated and untreated groups, and it was only after adjusting for the effect of cataract that a beneficial effect of lowering pressure could be demonstrated. Because some eyes deteriorated despite successful lowering of pressure, it was postulated that there existed mechanisms responsible for damage to the optic nerve, independent of pressure. Ocular hypertension (OHT) was another ethical loophole. Indeed, many patients with OHT were not normally treated, and there was uncertainty about whether lowering pressure would reduce the risk of developing nerve damage. The ocular hypertension treatment study (OHTS) was a multi-centre RCT based in the USA.4 Patients with raised pressure, but no definite nerve damage, were randomly allocated to treatment or none. Conversion rates were low in five years, but the study was large enough to detect a small treatment effect. It was possible to draw firm conclusions that there was a treatment benefit. The baseline risk of converting was small, about 10 per cent in five years. But treatment reduced this risk by half. The number of patients with OHT needed to treat (NNT) to prevent one from developing optic nerve damage, was about 15 for evidence of structural and/or functional damage, but 42 for functional damage only, i.e. new visual field loss. The question remained about the effectiveness of lowering pressure in overt disease. The early manifest glaucoma trial (EMGT)3 was designed to address this. To find 250 patients with early glaucoma, it was necessary to screen more than 60,000 people in southern Sweden. Half of these patients were randomly allocated to treatment and the other half to none. Using a sensitive algorithm for detecting progression in automated threshold perimetry, the trial found a much larger treatment effect, an NNT of 7. The difference between the treatment effect found in these two studies may reflect differences in the sensitivity of the methods used to detect change, but it can also be explained by differences in the participants. EMGT used a population-based sample identified on the basis of optic nerve head appearance and visual field abnormality, independent of IOP (the mean IOP was 20 mm Hg for the whole trial sample). The OHTS included patients already in clinics with raised pressure but normal optic nerve. They were effectively selected for resistance to the effects of pressure on the optic nerve. 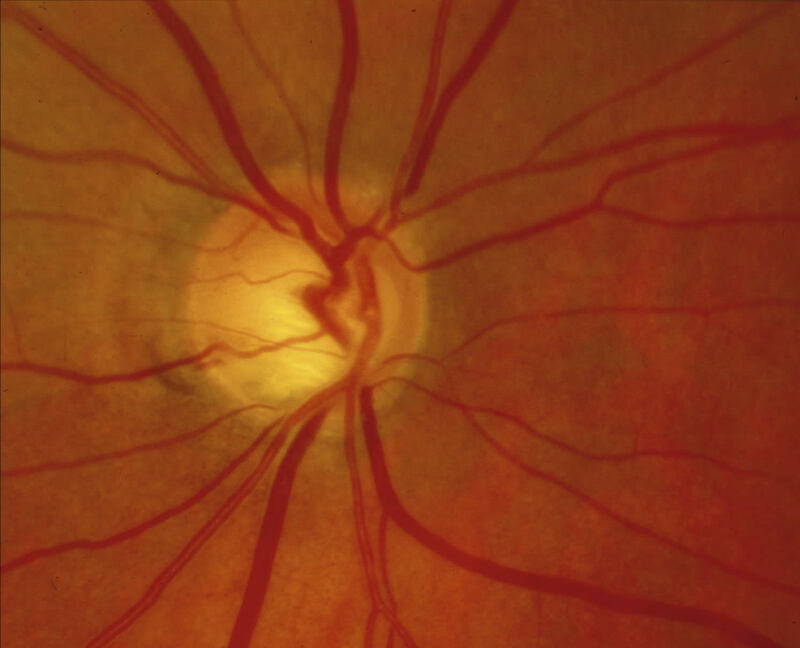 OAG is a disease of the optic nerve in which it is vulnerable to the effects of pressure. The higher the pressure, the more likely it is that damage will occur, though the vulnerability of the nerve to pressure is a crucial determinant of disease risk. In angle closure and angle-closure glaucoma, there is less evidence of effectiveness of treatments. Useful definitions have been proposed for these conditions, in which anatomical abnormalities of the angle with or without raised IOP are separated from those that cause damage to the optic nerve.10Most believe that the structural abnormalities of the anterior segment leading to higher (sometimes very high) pressure are more important than the vulnerability of the optic nerve, because almost every optic nerve will succumb to the effects of prolonged and excessive elevation of IOP in angle closure. There is no doubt that in acute angle closure there is an urgent need to reduce IOP. There are different ways of doing this. Ideally, this should be done as quickly as possible, while minimising the risk of making the patient feel even worse. Intravenous acetazolamide is often used for rapid action, as well as topical pilocarpine (there is no additional benefit from ‘intensive’ administration). Osmotic agents such as glycerol or mannitol have fallen out of favour, but evidence regarding the safety and effectiveness of these kinds of interventions is almost entirely lacking. Trials are needed to evaluate new treatments such as laser iridoplasty and lens extraction, and some are underway. No one doubts the need to do a peripheral iridotomy (PI) in acute angle closure, both of the affected eye and the contra-lateral one, as a preventive measure. This is not based on trial evidence, but on the observation that if this is not done, the probability of an attack in the second eye is higher than 50 per cent.11 However, this is not always the solution. Peripheral iridotomy or iridectomy solves pupil block, relative or absolute, if it is contributing to the glaucoma mechanism. It will have no impact if the angle is crowded by a swollen lens, or anterior displacement of the entire iris, lens, and ciliary body as in malignant glaucoma (aqueous misdirection), or acute choroidal effusions or haemorrhage. The best management of chronic angle closure and chronic angle-closure glaucoma remains uncertain. Imaging the anterior segment using high-frequency ultrasound (UBM) or scanning laser tomography (OCT) will help identify whether pupil block is an important component of the process. Many advocate iridotomy in case it is. We are currently awaiting the results of a trial of the effectiveness of PI as a prophylactic measure to prevent optic nerve damage. However, when pupil block is only marginal in the process, the angle recess may widen after PI, but the pressure is unaffected or may be higher. This is especially the case if high energy is needed to penetrate the iris with the YAG laser and much debris and pigment deposited in an already malfunctioning drainage system. In patients with thick brown irides, some advocate doing a surgical PI. Trials comparing laser and surgical PI showed that laser PI was as good as surgery but not better. Many of these patients also have an incipient cataract, a larger lens in a smaller eye (hypermetropia is a risk factor), and they will likely need cataract extraction before long. If they have already had a difficult laser PI, the iris will be adherent to the lens and the surgery more difficult, with a higher risk of corneal damage and other complications. Some time ago, clear lens extraction was advocated for chronic narrow-angle glaucoma (CNAG), but no trial was conducted and smaller incision cataract surgery was not so prevalent. Now the question is being asked again. A systematic review in the current edition of CLIB12 found no RCTs, and although some non-randomised studies suggest a benefit, there is an urgent need for new trials to assess whether primary lens extraction works as well, and is as acceptable to patients, as current management. Outcomes represent a great challenge in glaucoma since the aim of treatment is preserving sight in the long term. The natural history of the disease is as long as a clinician’s career, so it is inevitable that surrogate or proxy measures must be used. IOP has had to suffice for many short-term studies, but those asking the question about preserving sight must measure visual function. Progression, however measured, has become the key parameter, because we seek to reduce visual decay to a rate that is compatible with the patient’s sighted lifetime. It should be the primary outcome of any new trial. Harmful effects are of equal importance. There is a growing body of good evidence about the effectiveness of glaucoma treatments. In terms of VISION 2020, deploying an effective service for prevention of glaucoma blindness requires highly developed infrastructure, including fully integrated primary, secondary and tertiary eye care services. This is an ideal far removed from reality for most poorer countries, and is not in place in many so-called developed countries, including the UK, where people still present too late, with advanced optic nerve damage and a poor prognosis for a sighted lifetime. Many questions remain about the effectiveness of glaucoma treatment, but the most urgent need for evidence is for the best management of both acute and chronic angle-closure glaucoma. Some studies are underway but more are needed. Laser trabeculoplasty has been shown to be cheap and sometimes effective in trials. The use of the Diode laser, as a means of deferring the need for surgery in poorer countries, needs to be explored. In more affluent countries, a large trial is now needed to explore whether population-based screening for glaucoma can save sight. 1 Hollows FC, Graham PA. Intra-ocular pressure, glaucoma, and glaucoma suspects in a defined population. Br J Ophthalmol 1966 Oct;50(10): 570-86. 2 Rossetti L, Marchetti I, Orzalesi N, Scorpiglione N, Torri V, Liberati A. Randomized clinical trials on medical treatment of glaucoma. Are they appropriate to guide clinical practice? Arch Ophthalmol 1993 Jan;111(1): 96-103. 3 The Normal Tension Glaucoma Study Group. Intraocular pressure reduction in normal-tension glaucoma patients. Ophthalmology 1992 Sep;99(9): 1468-70. 4 Kass MA, Heuer DK, Higginbotham EJ, Johnson CA, Keltner JL, Miller JP, et al. The ocular hypertension treatment study: a randomized trial determines that topical ocular hypotensive medication delays or prevents the onset of primary open-angle glaucoma. Arch Ophthalmol 2002 Jun;120(6): 701-13. 5 Heijl A, Leske MC, Bengtsson B, Hyman L, Bengtsson B, Hussein M, Early Manifest Glaucoma Trial Group. Reduction of intraocular pressure and glaucoma progression: results from the early manifest glaucoma trial. Arch Ophthalmol 2002 Oct;120(10): 1268-79. 6 Maier PC, Funk J, Schwarzer G, Antes G, Falck-Ytter YT. Treatment of ocular hypertension and open-angle glaucoma: meta-analysis of randomised controlled trials. BMJ 2005 Jul 16;331(7509): 134-7. 7 Burr J, Azuara-Blanco A, Avenell A. Medical versus surgical interventions for open-angle glaucoma. Cochrane Database of Systematic Reviews 2004; Issue 2. Art. No. : CD004399.pub2. DOI: 10.1002/14651858.CD004399.pub2. 8 Rolim de Moura C, Paranhos A. Laser trabeculoplasty for open-angle glaucoma. Cochrane Database of Systematic Reviews 2002; Issue 4. Art. No. : CD003919. DOI:14651858.CD003919. 9 Vass C, Findl O, Sycha T, Bauer P, Schmetterer L. Medical interventions for primary open-angle glaucoma and ocular hypertension. Cochrane Database of Systematic Reviews 2004; Issue 3. Art. No. : CD003167.pub2. DOI: 10.1002/14651858.CD003167.pub2. 10 Foster PJ, Buhrmann R, Quigley HA, Johnson GJ. The definition and classification of glaucoma in prevalence surveys. Br J Ophthalmol 2002 Feb;86(2): 238-42. 11 Edwards RS. Behaviour of the fellow eye in acute angle-closure glaucoma. Br J Ophthalmol 1982 Sep;66(9): 576-9. 12 Friedman DS,Vedula SS. Lens extraction for chronic angle-closure glaucoma. Cochrane Database of Systematic Reviews 2006; Issue 3. Art. No. : CD005555.pub2. DOI: 10.1002/14651858.CD005555.pub2.